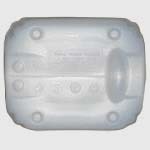 Jerry cans are put together with cover- seal, seal ring to provide hermiticity. 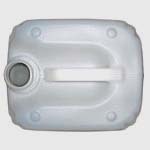 Jerry cans may be equipped with pressure isolation valve. 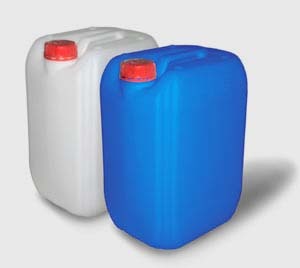 21, 5 L (Euro) jerry cans stackable on pallets is specially designed for transportation of wide range of products both aggressive and gassing substances. Stable construction of the containers enables to stack them without any additional sealing material, and overall dimensions are suitable to standard pallets. The containers are used for hot cargo transportation and storage. The container is certificated according to the rules of hot cargo transportation (U/N Certificate), and GOST 26 319 (Dangerous cargo. Packaging).